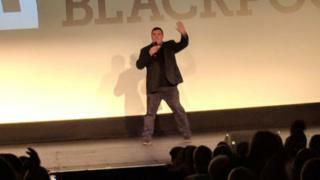 Peter Kay has appeared on stage for the first time since cancelling all future work projects, including his stand-up tour, for family reasons.The comedian greeted almost 3,000 fans at Blackpool Opera House, following the last of three charity screenings of his BBC comedy Car Share. The 44-year-old thanked the audience for coming to see the special finale of the sitcom plus an improvised episode.The episodes were filmed before Kay's announcement last December.The second series of the Bafta-winning Car Share ended on an emotional cliffhanger in 2017 when Kay's character John failed to reciprocate the advances of his car share colleague Kayleigh, played by Sian Gibson. Writing on Twitter, fans at the Blackpool screening said it was "great" and "amazing" to see Kay, while praising the Car Share episode as "fantastic". They saw what happens between John and Kayleigh but have vowed to keep the ending a secret. The finale will be aired by the BBC in May. The Phoenix Nights star had been due to start his first tour in eight years this month, but announced in December that he was pulling out of all commitments "due to unforeseen family circumstances". "This decision has not been taken lightly and I'm sure you'll understand my family must always come first," he wrote on Twitter.Kay currently holds the record for the biggest-selling comedy tour of all time after playing to 1.2 million people in 2010 and 2011.